What better way to start spring break then with an indoor track meet? 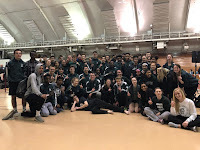 The Madison Memorial boys and girls track and field teams took on the city schools for the indoor championships held at the Shell on UW-Madison campus. There were many great performances by both squads which led the girls to 76 points and a 2nd place finish behind West's 86 points and the boys team to 82 points for a 2nd place finish behind LaFollette's 96 points. This is very early in the season for a championship meet and is more of a learning experience then a "show us your best" type meet. That being said, JMM provided many exciting moments for this early in the season crowning TEN City Champions. Individuals score points at this meet with top five finishes: the girls had 12 different athletes score and scored in EVERY event; the boys had 13 different athletes score and scored in EVERY individual event. As nice as it was to see 10 city champions today, as coaches we know that we can increase this number as we move towards the outdoor season. It is important that we continue to work hard every day at practice and focus our attention towards bigger things at the end of the season. Trust and believe in your coaches and push your teammates every day to work their hardest...we have many goals yet to reach. The boys team was led by Daurice F who set a new indoor city record with his victory in the 55 hurdles of 7.66, a new indoor city record and SCHOOL RECORD long jump of 23' 3.5", and was a member of the city champion 4x400 team. Jester W won the 55m dash in 6.44 and added a second in the 200m dash with a time of 23.38. Tyler M won the 3200m run, the longest race of the day in the smallest margin of victory, with an excellent kick to win by .01 running a 10:35.10. The 4x400 relay team of James A, Daurice F, Josh P, and Nick M came from behind to win a city championship in 3:36.34. Josh P also scored points in the 400m dash and 800m run. While Nick M also scored points in the 55 hurdles and 400m dash. Jonah W provided a second place finish with his 4:26.29 in the 1600. Jeremy G took second in the shot put with a throw of 44' 2.25" and his throwing teammate Ryan B tossed the shot 42' 3" for third place. Raquan C placed 3rd in the 55m dash and Jake A placed 5th, giving the boys team 3 sprinters scoring in the 55m dash. Micah P jumped 19' 9" in the long jump for 4th, Zach O cleared 7' 0" in the pole vault for 4th place, and Jared B cleared 5' 4" in the high jump for 5th place. This was a great meet across the board showing nice depth and diversity for track & field this season. The girls team was led by Marissa H and Kayla G as Marissa won the 55m dash in 7.66, the 200m dash in 27.83, and finished 2nd to her teammate in the high jump with a clearance of 4'8" while Kayla G won the high jump in 4'8", the pole vault in 8' 3", and was a member of the 4th place 4x100 relay with Phibi M, Skyylah G, and Marcella V. Corrine F added a 1st place in the shot put with a throw of 34' 8". Sienna C provided a 2nd place finish in the 3200m run with a time of 12:24.35. Rachel B ran a 7.92 for 3rd in the 55m dash and 28.87 in the 200m dash for 4th place. Phibi M took 3rd in the 55m hurdles with a 10.02. Freshmen Sydney S (1:08.21) and Sarah H (1:08.54) went 4th and 5th in the 400m run. While Meghan S went 4th in the 800m run (2:36.87) and Sara N was 5th in the 1600m run (5:52.96). In the field events Sarah H went 4' 4" for 4th in the high jump, Robyn B went 14' 5" in the long jump for 5th, and Claire F threw 30' 3.5" for 5th in the shot put. The girls team welcomed back some familiar faces at this meet and saw many new faces, including freshman, stepping up and ready to score points. Corrine F - 9th in shot put - 36' 9"
Daurice F - 1st in long jump - 23' 3.5"